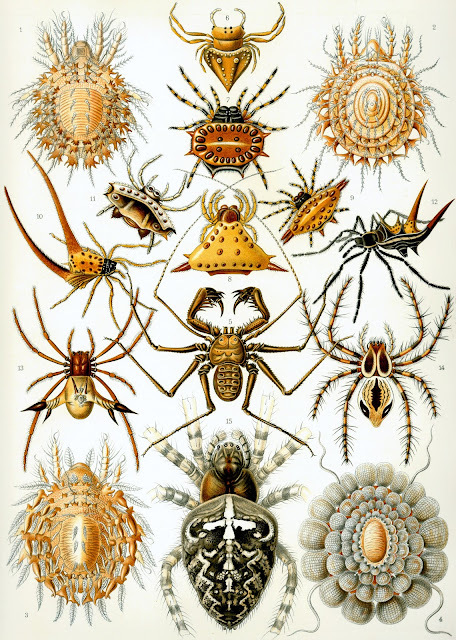 Haeckel produced illustrations that people could take in and understand, images that glowed with color and brought the exotic and remote in to the libraries of the world. Really, there had not been anything like these extraordinary prints before. 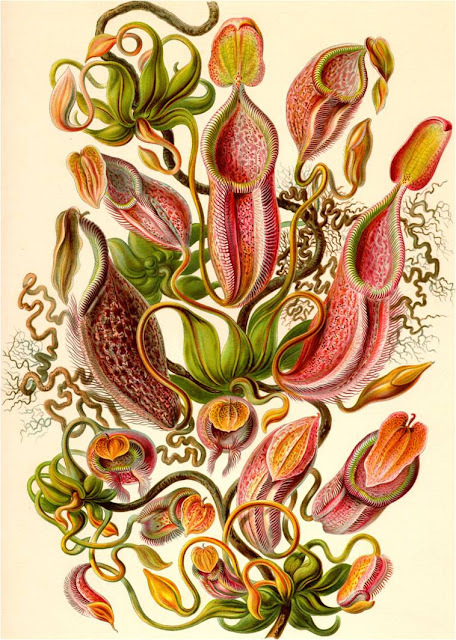 They were the culmination of decades of works for Haeckel, a contemporary of Darwin and he did much to popularize the work of the English naturalist - although their ideas did diverge at several important points, as we shall later discover. 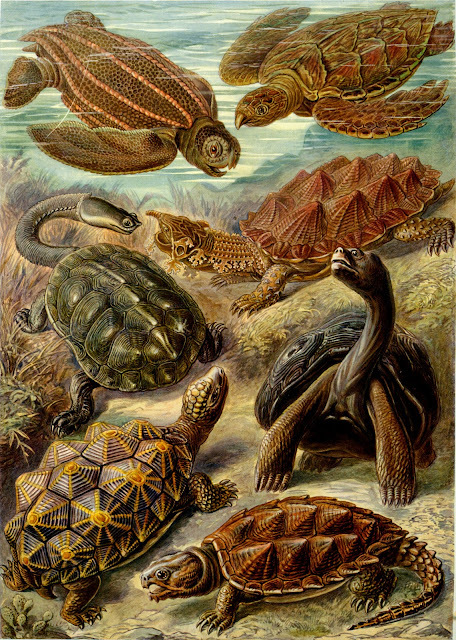 The above is the 89th plate from Art Forms of Nature and shows a variety of turtle species. From the Leatherback at the top left to the Common Snapping Turtle (bottom right), Haeckel captures them marvelously. This was no attempt at photorealism, however. Note how sea and land (seamlessly) merge in the picture. His images, did, however, encapsulate his sense of order. They still look like something out of a science fiction novel, so imagine how they must have seemed to their late Victorian audience. The central medusa is Desmonema annasethe which was first categorized by the man himself. It was named after his wife, Anna Sethe, who had died the previous year. A mistake commonly held is that Darwin’s tome, the On The Origins of the Species was massively illustrated. In fact it was not a work of popular science, it was a technical book. Although the sales belied the fact, many if not most people would have been immediately confused by much of Darwin’s language. In fact he was the Steven Hawking of his day. Many people bought On The Origin of the Species, much as a century later they would buy A Brief History of Time. Few would get to the end of either. 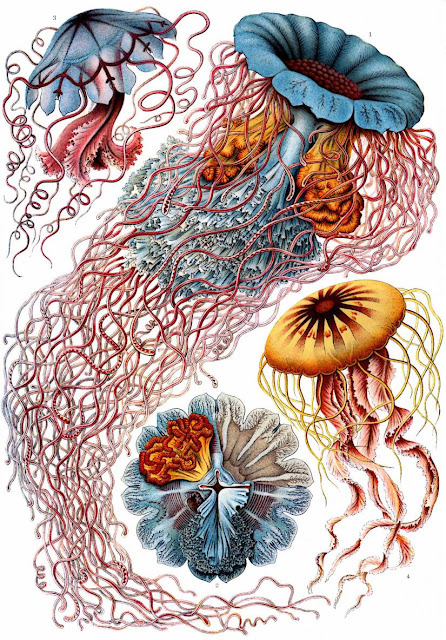 Haeckel looked at the Origin of the Species and realized that it would not be completely understood by the literate class. Origin was hugely difficult, plus it was long and had only few illustrations. So in 1868 he published Natürliche Schöpfungsgeschichte (published in English as The History of Creation). It was a hugely provocative title for the time (Haeckel was not an ingénue, he knew this) and it was massively successful, being reprinted many times over the next few decades. Art Forms of Nature, from which the print of spiders above is taken, would be the pinnacle of his attempts to marry art and science. There was a method behind the choices that Haeckel used for publication. His world view – politically as well as naturally – was one of order, organization and symmetry. The subjects of each lithographic plate were carefully selected so that they would encapsulate the organization of organisms – with symmetry of paramount importance. 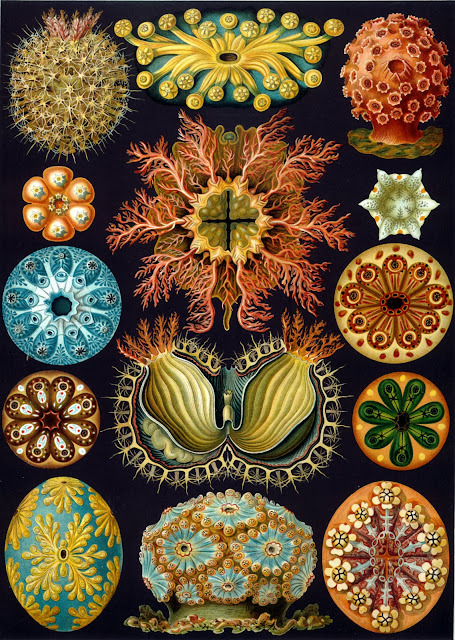 Each image of each plate was carefully arranged to maximize their visual impact and to drive home Haeckel’s world view. The illustration below made up the first plate of the second volume of Art Forms of Nature and shows radiolarians – classified as Discoidea. They would help promote and encourage one of the fads of the time – that of parlor microscopy. Although his art is somewhat exaggerated there is no denying its beauty. We have the advantage of television and video, where the wings of the hummingbirds above can be slowed down to a fraction of their normal speed. 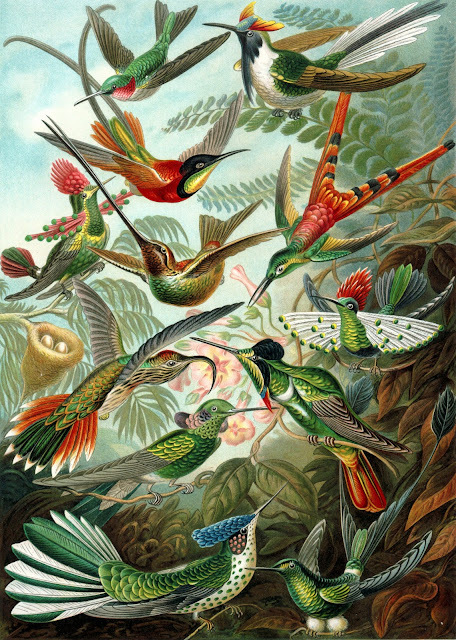 Of course in the early twentieth century no such technology existed but the lithos of Haeckel enabled people to see the exquisite creatures in flight – and without the necessity of visiting them in taxidermic form in museums. It is no surprise, then, to learn that a large amount of art nouveau artists and architects found his work inspirational. His influence can be seen in the works of the likes of Hans Christiansen, Karl Blossfeldt and Hendrik Petrus Berlage. As in his art, so in life. 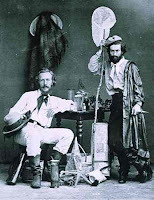 This carefully composed photograph shows Haeckel (left) and his then assistant Nicholai Miklukho-Maklai in the Canaries in 1866 when he was thirty two years of age. He was no stay at home biologist and naturalist. Throughout his lengthy career he discovered several thousand new species. He also coined many biological terms that we use today, the most notable being the word ecology. 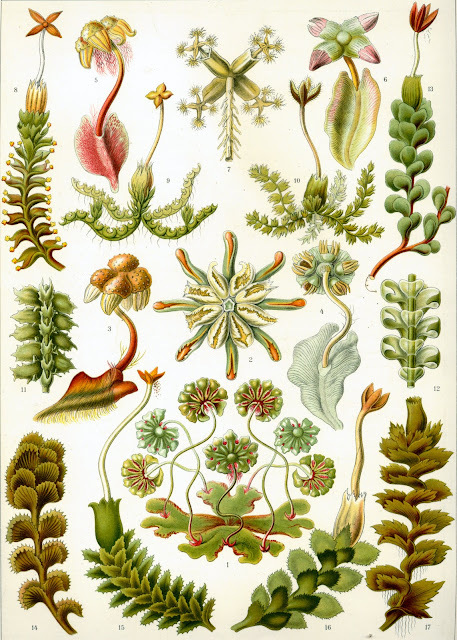 A variety of moss species, then classified as Muscinae. We now classify them as Bryophyta which includes not only mosses but hornworts and liverworts as well. This was the seventy fourth plate in the Art Forms of Nature series. 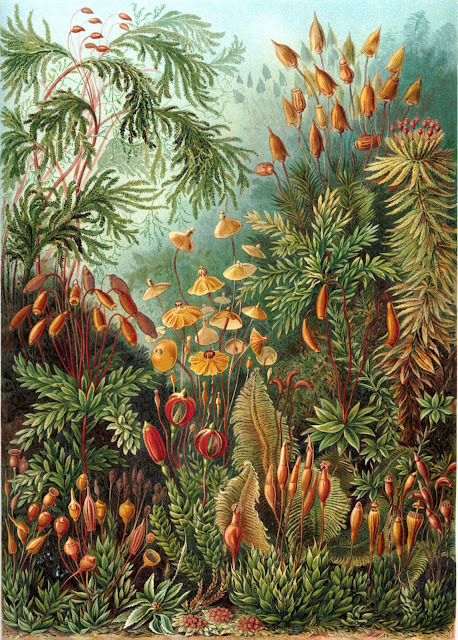 During his career Haeckel produced over a thousand engravings based on the watercolors and sketches he had made on his travels. Of these one hundred of the best were put together to create the ten volumes of Art Forms of Nature. The first volume came out in 1899 and the final in 1904 (when they also became available as a complete work). 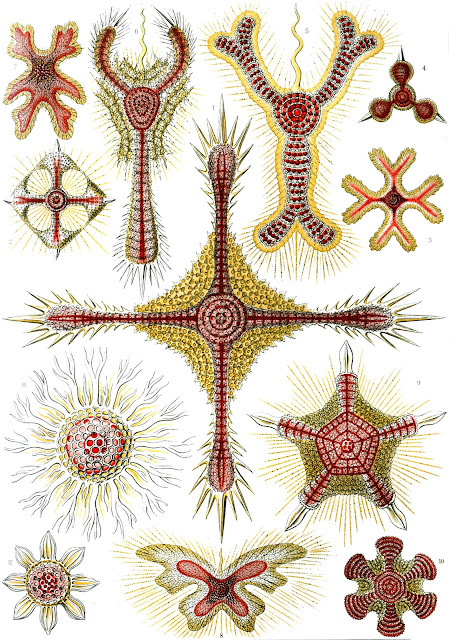 Many of the organisms included in the tome were first described and classified by Haeckel himself. It must be noted here the contribution of Adolf Gilitsch, the lithographer who translated them from sketch to print. 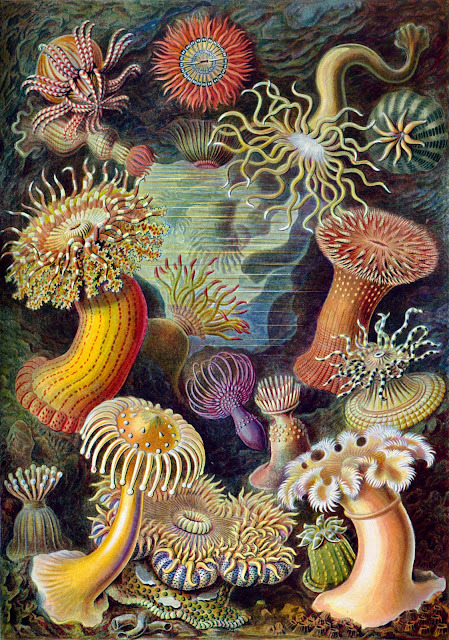 The forty ninth plate shows a variety of sea anemones. Although his accomplishments as an artist cannot be denied – and many of his ideas are important to evolutionary theories there are several large and outstanding buts. Some of his ideas around microorganisms leading to humanity have been disproved. He also took some rather large leaps in the dark, albeit leaps available from evidence which existed at the time. He sent a pair of his students to Indonesia on a wild goose chase, in pursuit of the human ancestor (no remains of which had then been found) that he had decided would most definitely be found there. Needless to say it wasn’t. Somewhat more frightening was his belief in the superiority of some types of human over others. A depiction of a variety of lizards makes up the seventy ninth lithograph. The eight lizards pictured were chosen to demonstrate the diverse examples extant in the Lacertilia suborder. Some of the colors and certainly the spatial composition of the print are an aesthetic choice much more than a true reproduction of nature. 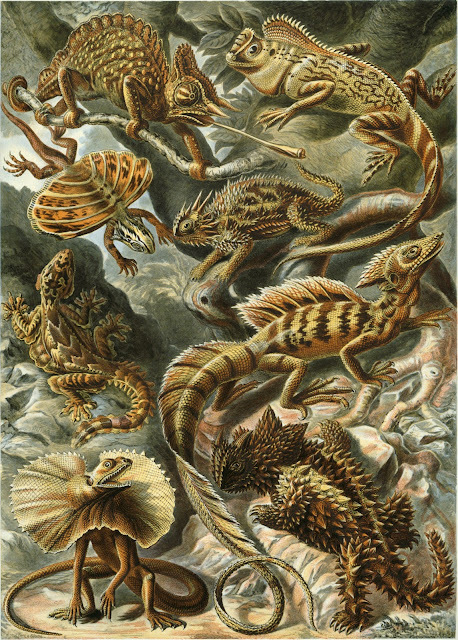 The chameleon in the top is shown in comparison to the flying dragon and Texas Horned Lizard of the second. We have the Flying Gecko on the third and on the bottom the Thorny Devil. In the little more than a hundred years since this print was produced the suborder here has been replaced by a bewildering array of new infraorders and suborders. 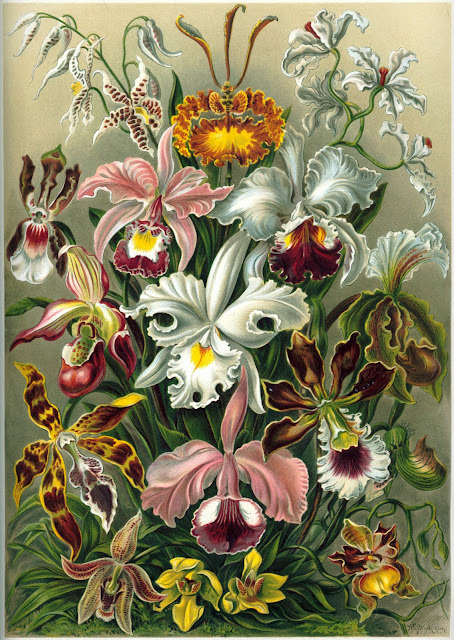 The seventy fourth plate shows a variety of orchids, resplendent when shown all together and showing the huge variety of the species in just a few examples. 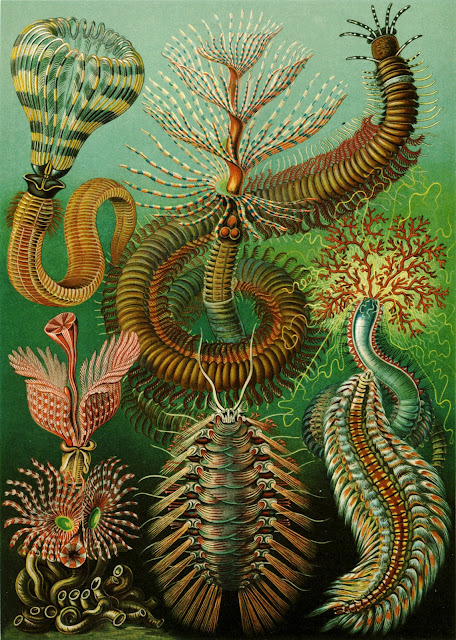 Although a huge supporter of Darwin, Haeckel did not believe in Natural Selection. Instead he believed in Lamarckism. Put simply this is the belief that the efforts of an individual organism during its lifetime in terms of acquired characteristics can be passed on biologically to its offspring. Otherwise known as soft inheritance, this theory has been abandoned now but it is still of some use. Certainly, an examination of the evolution of human ideas and cultures could be placed within the idea boundaries of Lamarcksim and it is in fact related to memetics – the study of self-replicating units of culture. Frogs classified as Batrachia make up plate number sixty eight. 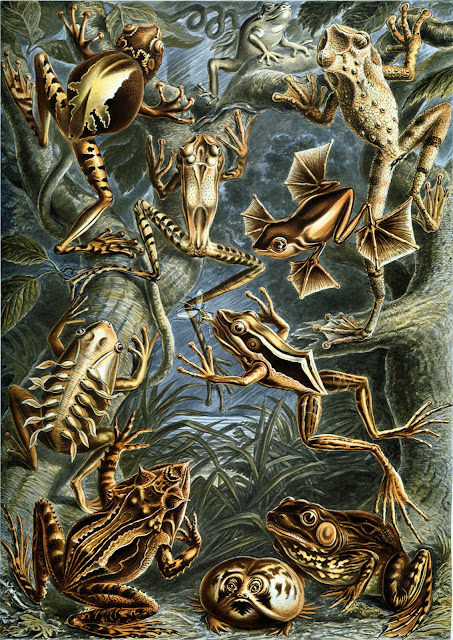 Top left can be seen the pouch frog of Venezuela. The females have a back pouch in which the eggs develop until they are ready to hatch as tadpoles. Also shown is the Flying Frog of Borneo – the one leaping through mid air, with its widened foot webbings. These webbings are used as a form of parachute which enables the frog to leap from tree to tree without falling from the canopy. Segmented worms! Haeckel would also be proved wrong in his ideas about the evolution of man. He took a linguistic approach which he then developed in to a multi-regional hypothesis that various species of Homo sapiens had evolved in isolation of each other. This was very much against Darwin’s Out of Africa theory and remained very much the main competition until the 1990s. Darwin’s theory has been shown to be correct since the human genome was finally deciphered. Ascidiacea or as we know them more commonly, sea squirts, is the eighty fifth plate and the black background contrasts beautifully with the colors of the squirts. Although many of his theories were disproved Haeckel did show prescience in another field – modern history. He was the first person to use the term First World War. In a letter to a newspaper he wrote “There is no doubt that the course and character of the feared "European War"...will become the first world war in the full sense of the word”. This was in September 1914. Although he made many mistakes which to our modern sensibilities are somewhat shocking, Haeckel was very much of his own time. He will probably in the future be remembered more for his exquisite representation of life on earth and his ability to transport people from the comfort of their homes to see places and lives unimagined than some of his more outlandish ideas which will be quietly buried in the shifting sands of history.